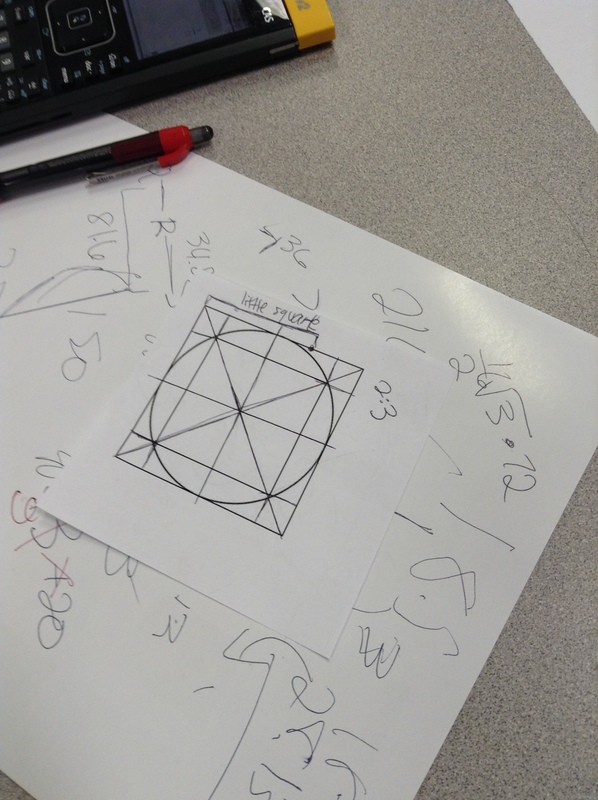 I recently participated in the Mississippi Department of Education Geometry Institute. 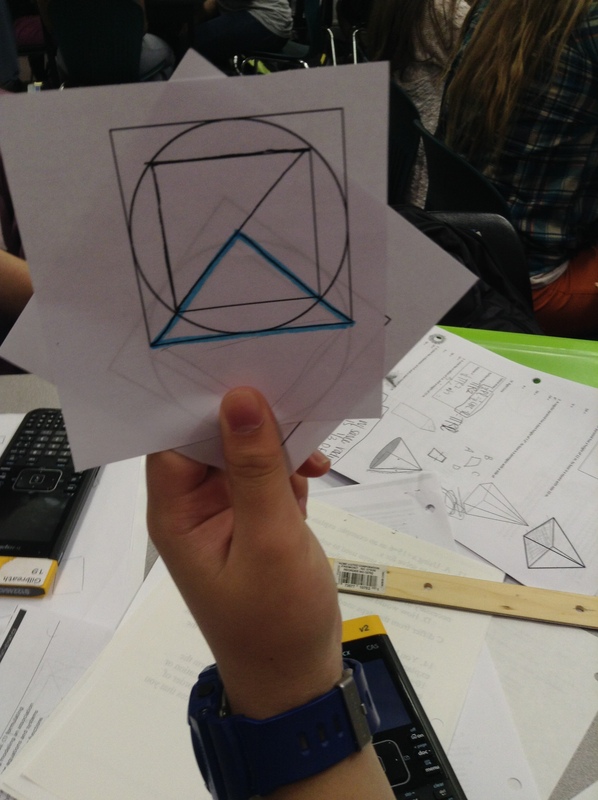 In our session on Geometric Measure & Dimension, we moved from areas of special quadrilaterals in the coordinate plane to proving the area formulas for a kite and a rhombus. 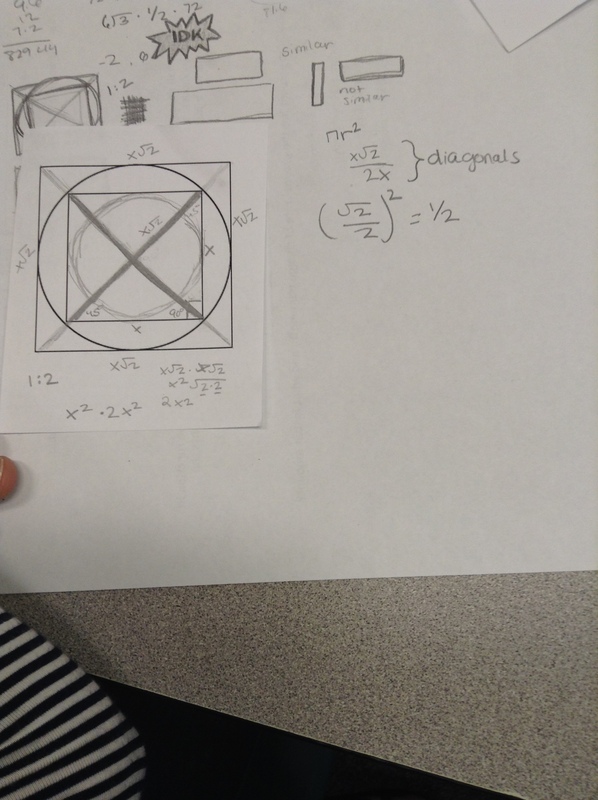 We had practiced look for and make use of structure on two kites, c and f. Participants had shared their thinking on kite c.
Could they transfer what they had done in the coordinate plane with known segments lengths to a rhombus and a kite with diagonals d1 and d2? Just like our students would, some teachers struggled with the idea of generalizing the formula. Several used rulers to measure the lengths of the diagonals or made up numerical lengths for the diagonals and calculated the area. Can you tell how these participants generalized their work? I gave the kite as an assessment item for my students last year, and I asked them to practice “I can look for and make use of structure” along with “I can show my work”. Whose work can you understand without asking for clarification? 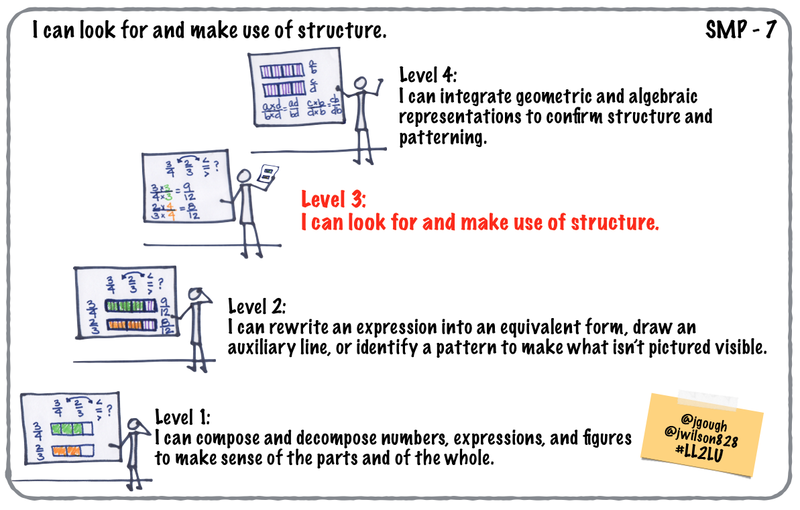 What opportunities do you give your students to practice “I can look for and make use of structure” along with “I can show my work”? 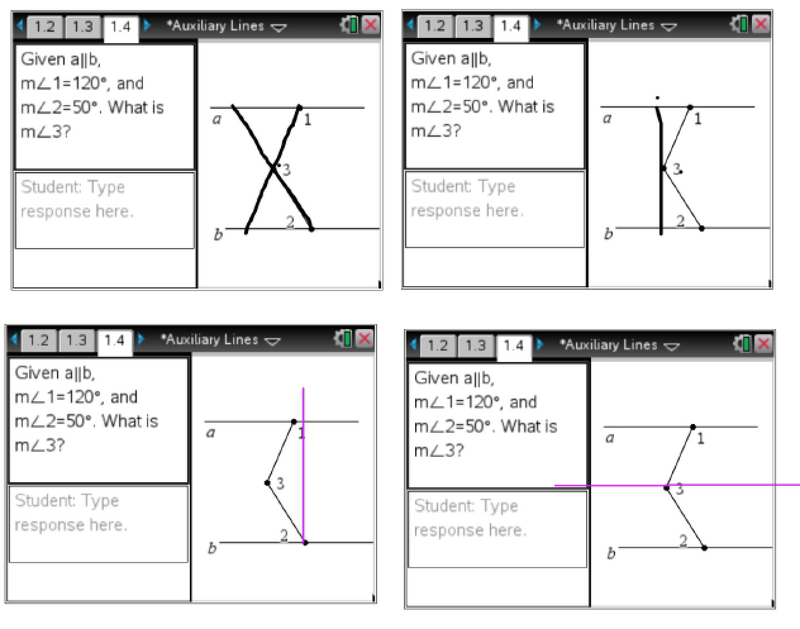 Several months ago when I was preparing a session on Geometric Measure & Dimension for the Mississippi Department of Education Geometry Institute, I noticed a blog post by Kate letting us know about some new IM tasks. 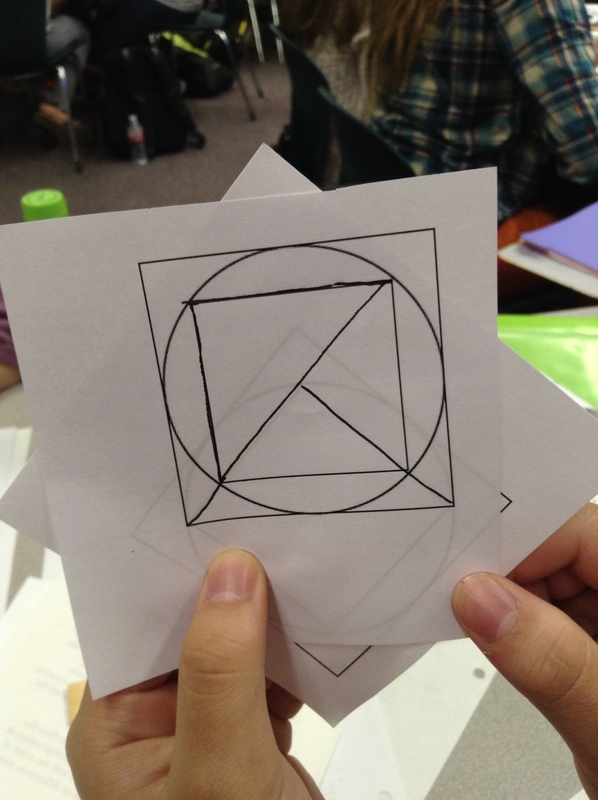 Areas of Special Quadrilaterals (and one triangle) caught my attention, and so I took a look. I had no idea at the time how perfect this task was for starting the session. Jill Gough and I often talk about pairing a content standard with a practice standard. 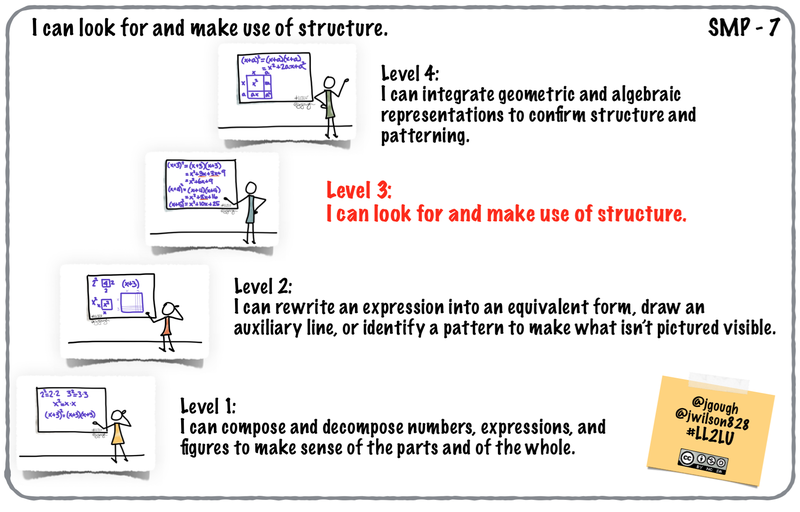 And the practice standard was look for and make use of structure. 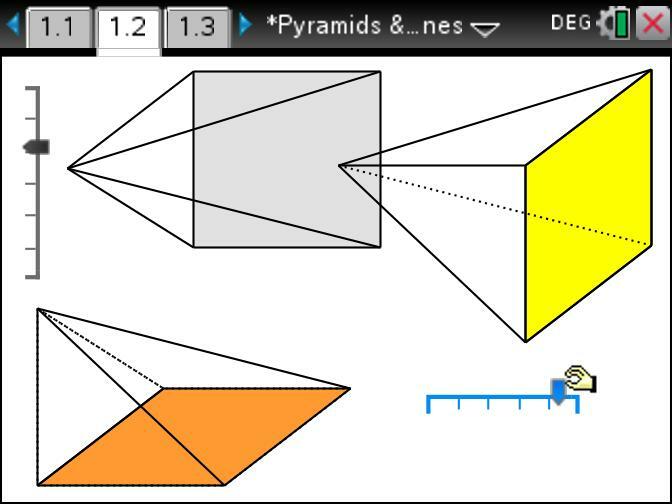 How would you find the area of each figure, composing into rectangles or decomposing into triangles and other shapes? Many teachers used color to make their thinking visible. I learned quickly, however, not to assume that they had found the area a certain way just because of a certain auxiliary line. I walked around, asking about their thinking, selecting and sequencing for our whole group discussion. We started with figure a. 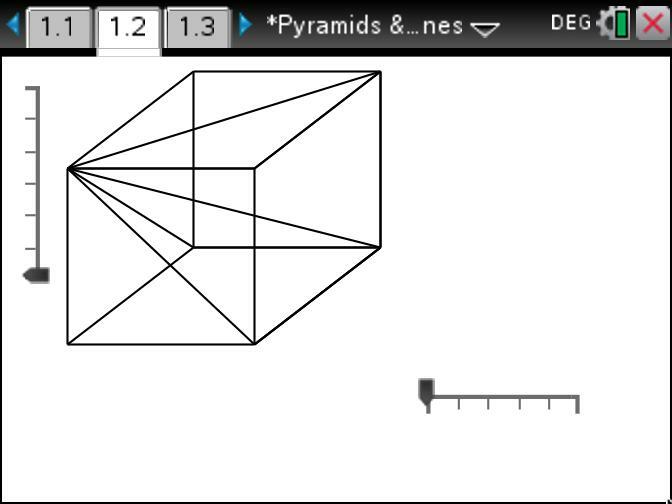 Some decomposed into a rectangle and two triangles. Some decomposed into unit squares. 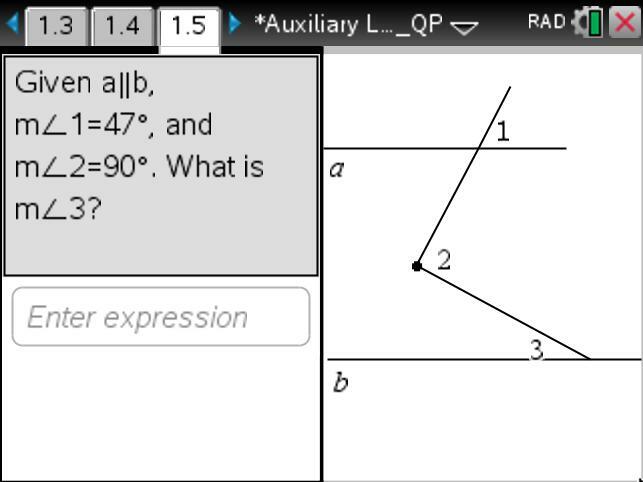 Some composed into a rectangle to think about the areas of the two small triangles. Others decomposed into a rectangle and two triangles but then rearranged the two triangles into a rectangle. Others translated one triangle horizontally to rearrange into one rectangle. One lady had not taught geometry for a very long time. She said she thought she knew a formula that would work for calculating the area, but she wasn’t confident about her work. Her formula? 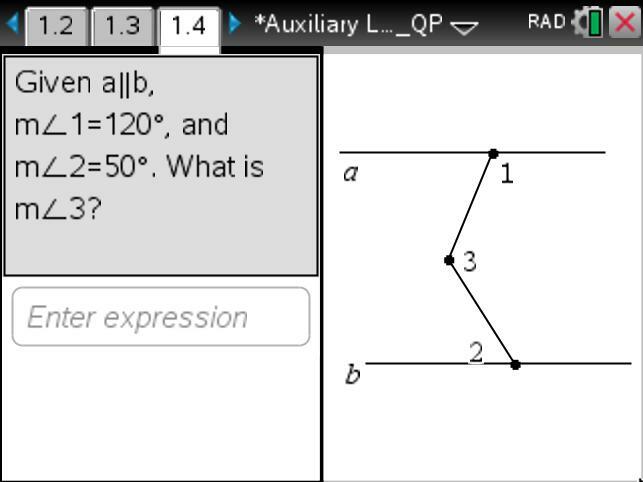 A=½h(b1+b2). 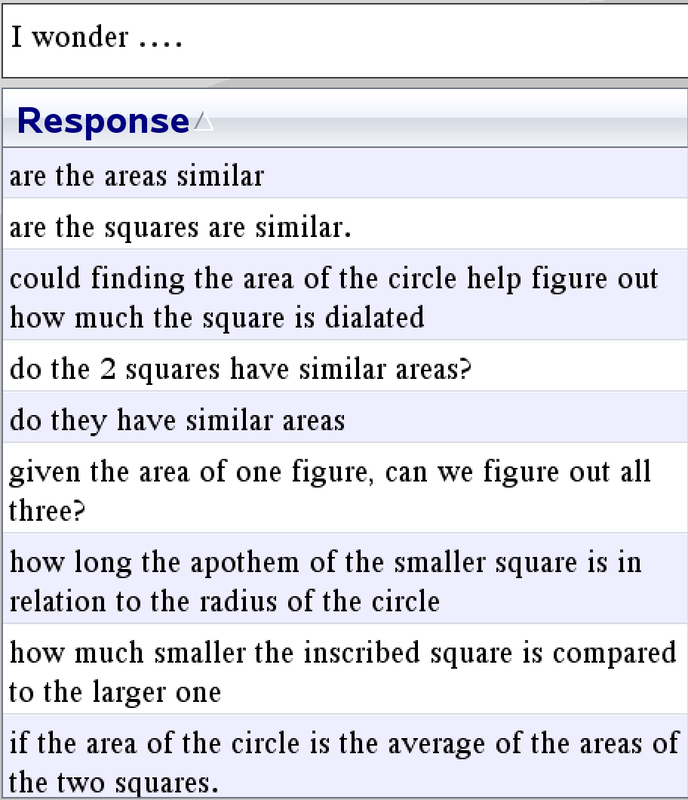 Most participants knew that formula as the area of a trapezoid. Does it work for the parallelogram? They tried it. It worked. Maybe that adds to our reasons for considering the inclusive definition of trapezoid? 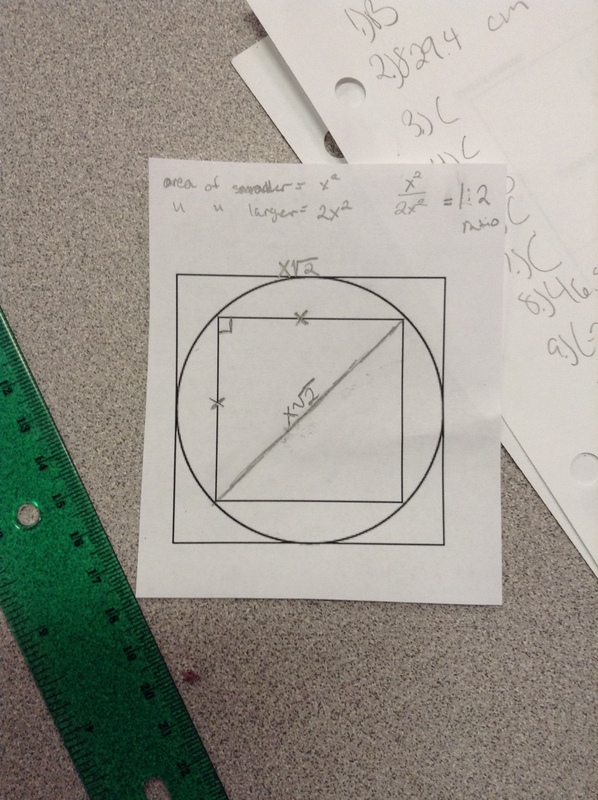 We looked next at figure d.
Some composed into a rectangle and subtracted the area of the right triangle. Some decomposed into a triangle and rectangle. One decomposed into a triangle and parallelogram. Some decomposed and rearranged into a rectangle. 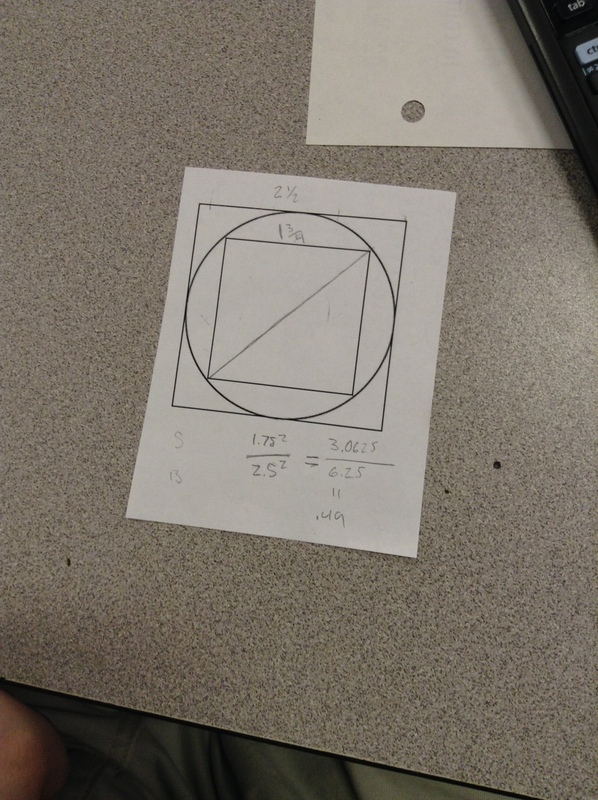 Then we looked at figure c.
Composing into a rectangle. 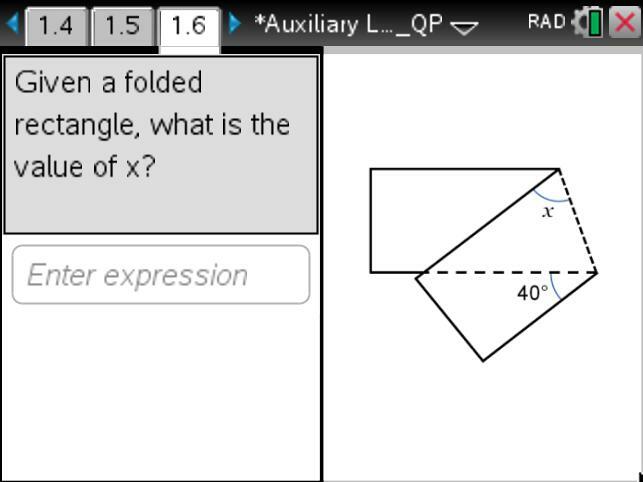 From there, some subtracted the area of each right triangle. Some halved the area of the rectangle. Decomposing into triangles. 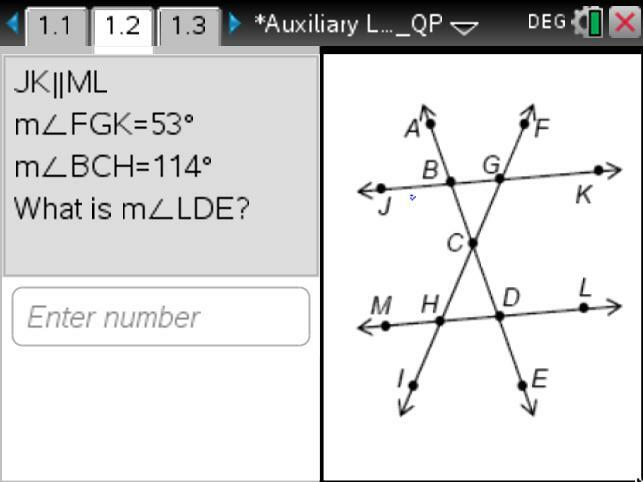 Some into 4 triangles with both diagonals. 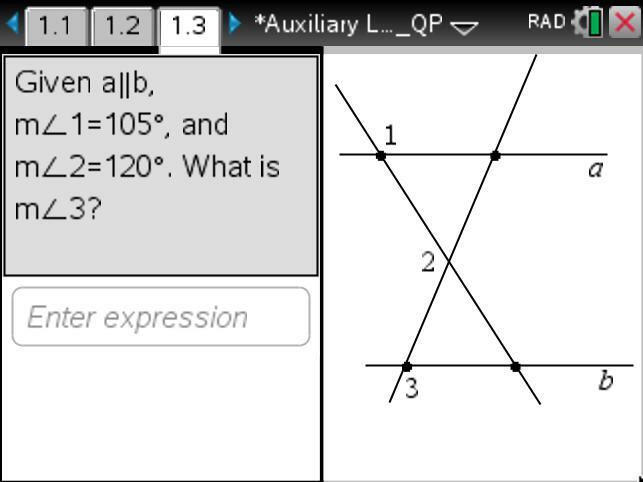 Some into 2 triangles with the vertical diagonal. Some into 2 congruent triangles with the horizontal diagonal. Everyone practiced look for and make use of structure in ways they hadn’t thought to before. 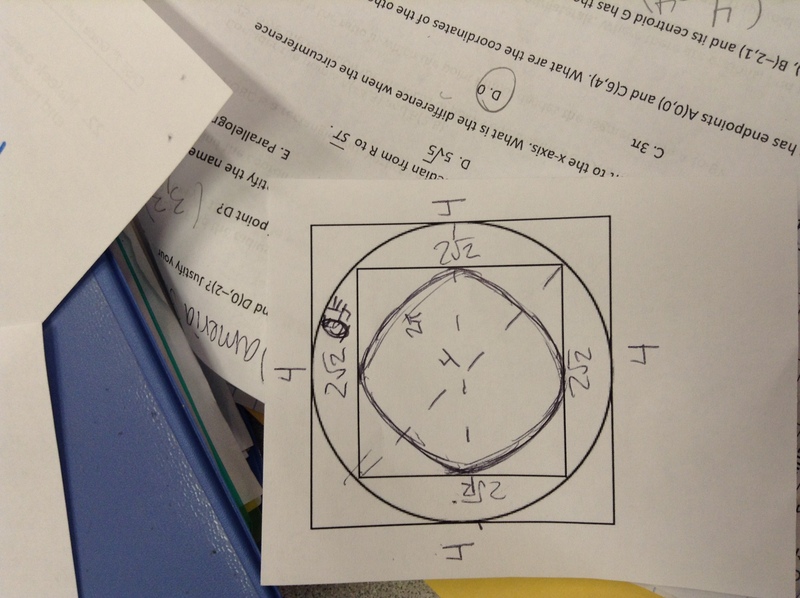 Everyone worked on their mathematical flexibility to find more than one way to determine the areas of the figures. Everyone learned at least one new way to look at the figure from the others in the room. What opportunities do you provide your learners to look for and make use of structure and then share what they’ve made visible that wasn’t pictured before? 1. 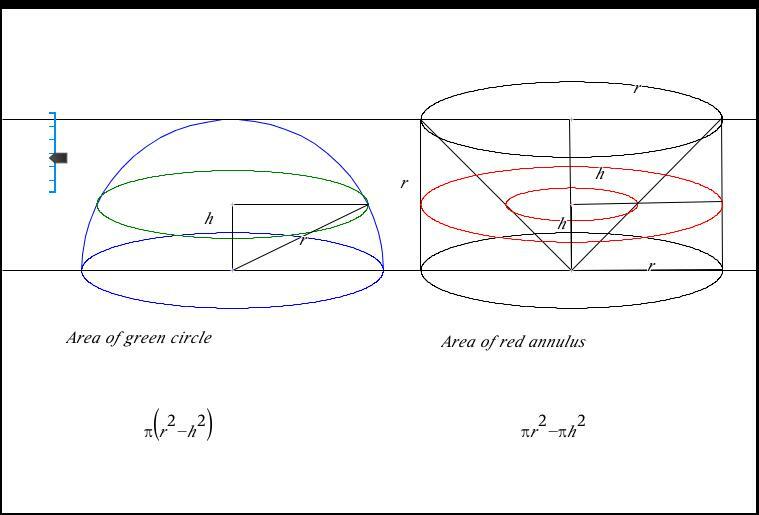 Give an informal argument for the formulas for the circumference of a circle, area of a circle, volume of a cylinder, pyramid, and cone. Use dissection arguments, Cavalieri’s principle, and informal limit arguments. 2. (+) Give an informal argument using Cavalieri’s principle for the formulas for the volume of a sphere and other solid figures. 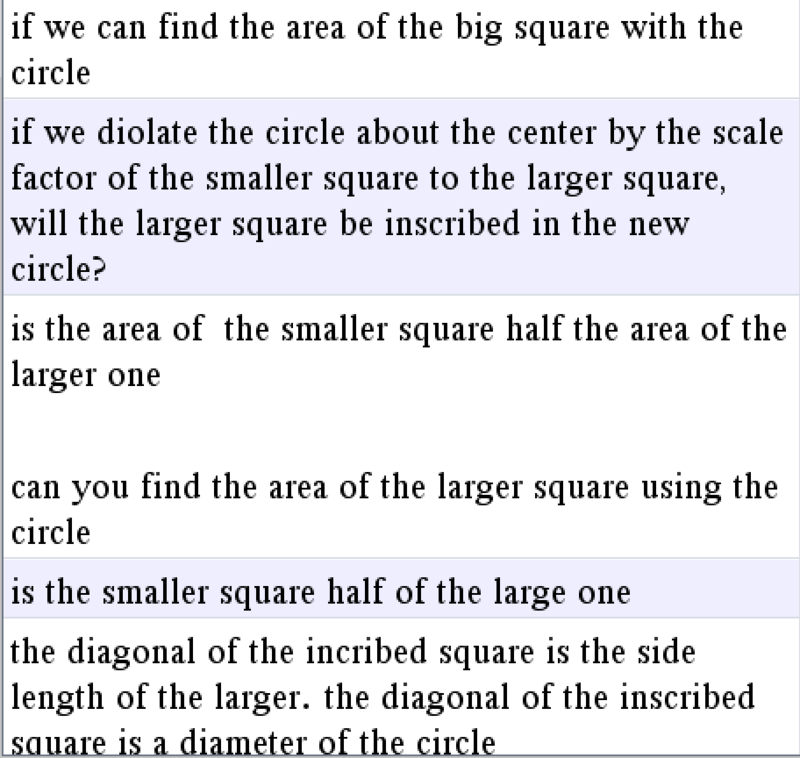 How do you provide students an opportunity to make sense of volume formulas? I’ve written before about how we use informal limit arguments to make sense of volume formulas for the cylinder and prism and then Power Solids to make sense of volume formulas for the cone and pyramid. Using a slinky, we briefly discuss Cavalieri’s principle. Solids: equal height, cross sections for each plane parallel to and including the bases are have equal area. When we get to the volume of a sphere, I’ve always told my students they’ll have to wait until calculus to make sense of the formula. If I ever made sense of the volume of a pyramid or sphere using Cavalieri’s principle while I was in school, I don’t remember. (Surely I’m not the only one.) This year, though, I’m determined to do better. I’ve been saving Pat Mara’s TI-Nspire documents to think this through. 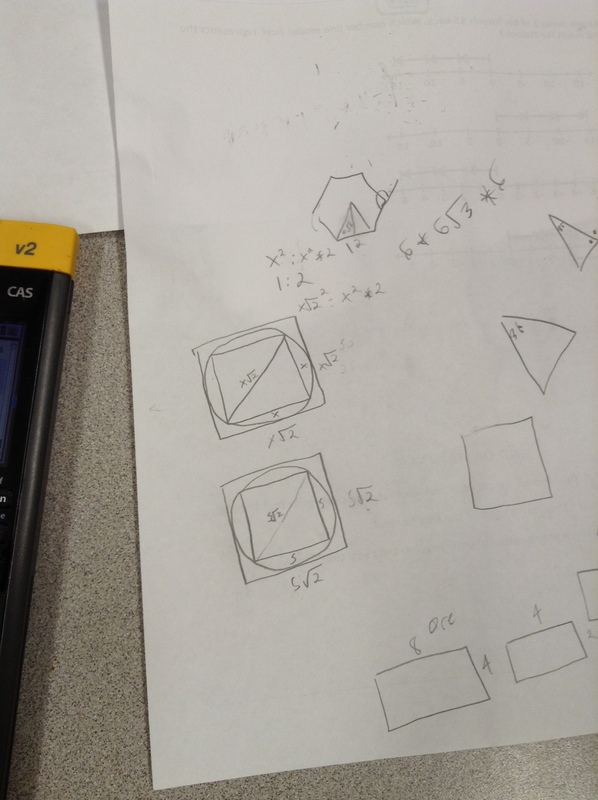 How can you use these images along with Cavalieri’s principle to make sense of the formula for the volume of a square pyramid compared to the volume of a square prism with base and height equal to the pyramid? 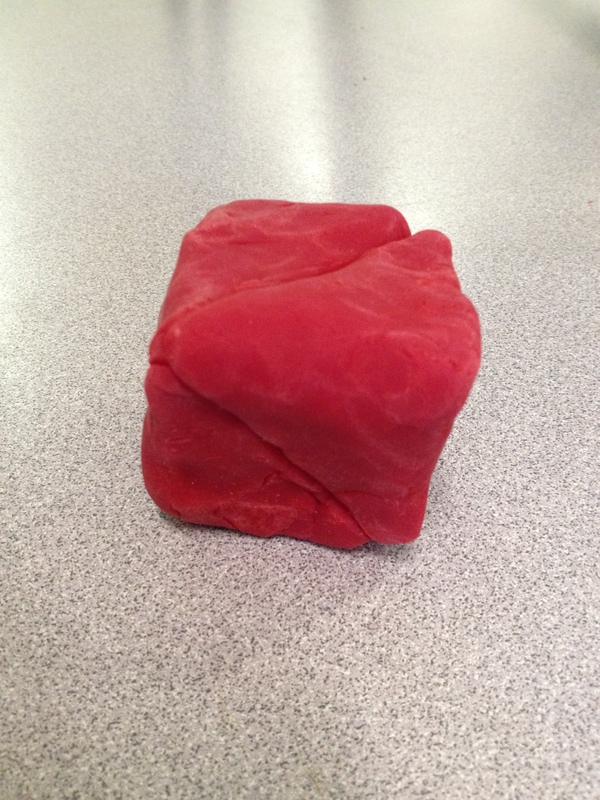 When I got out the play dough to make more sense of the dissection of the cube, my coworker joined me. 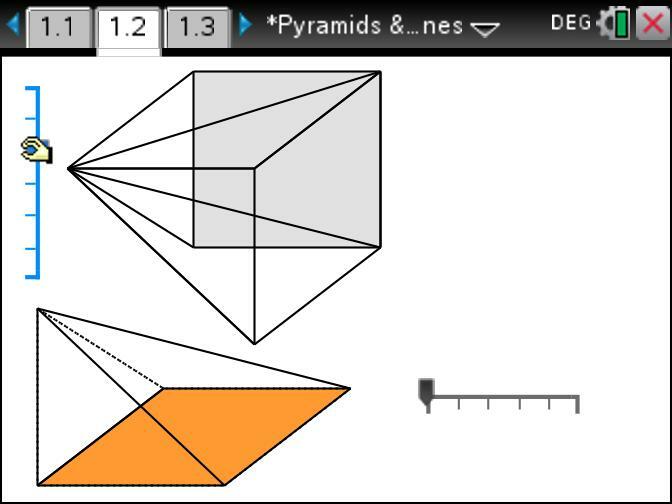 Our solid isn’t beautiful, but we get why the three square pyramids have the same volume and why one square pyramid will have a volume that is one-third of the square prism with base and height equal to the pyramid. 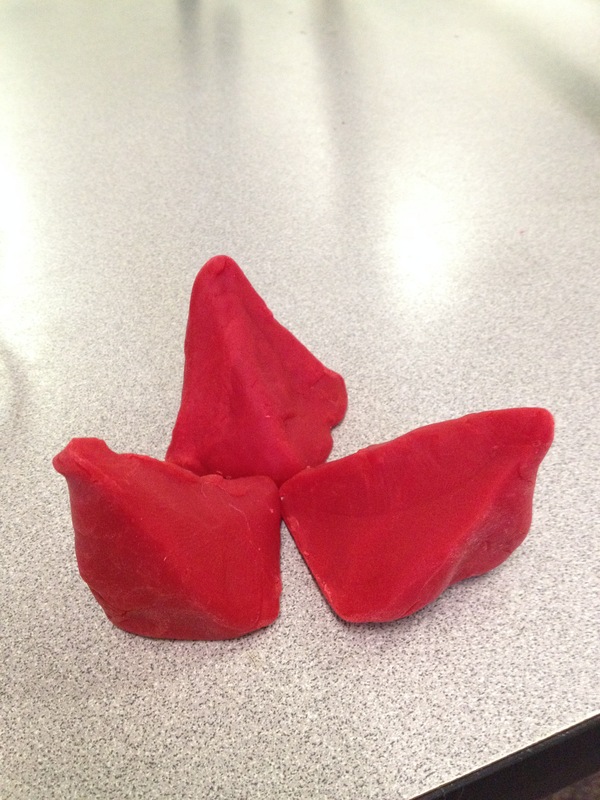 What can you say about this square pyramid and cone? I like the visual image of seeing cross sections that aren’t congruent but have equal area. On the left, a hemisphere. On the right, a cone cut out of a cylinder. What’s the same about the solids? 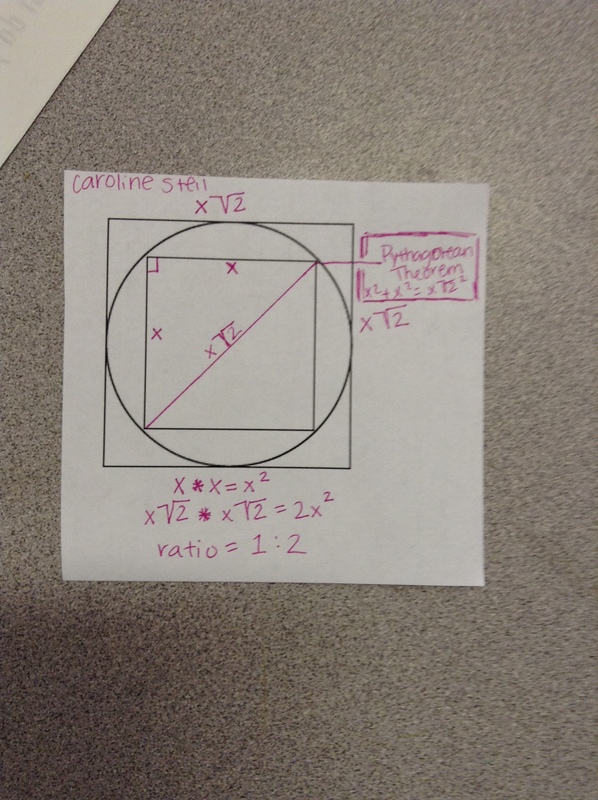 The sphere and the cylinder have equal radii and equal heights. Since the “height” of the sphere is its radius, the cylinder has height equal to radius. 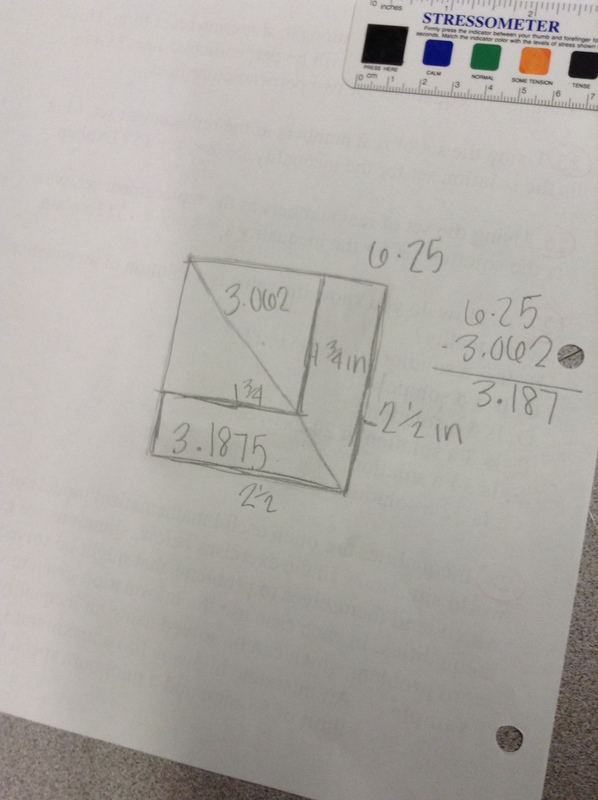 What are the horizontal cross sections? On the left, a circle. 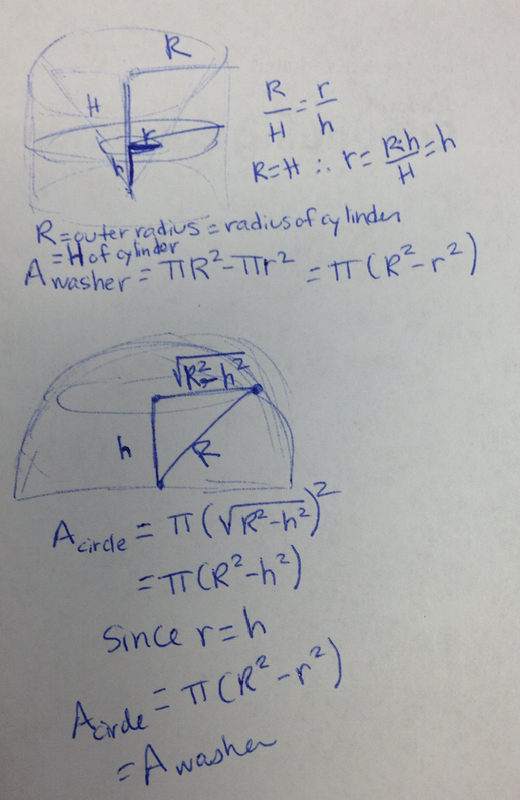 The radius decreases as the cross section slices go from bottom to top. On the right, a “washer” (or officially, an annulus), where the outer radius is always the radius of the cylinder (constant) and the inner radius is equal to the height of the smaller cone formed with the inner circle of the slice and the center of the base (shown by similar triangles). 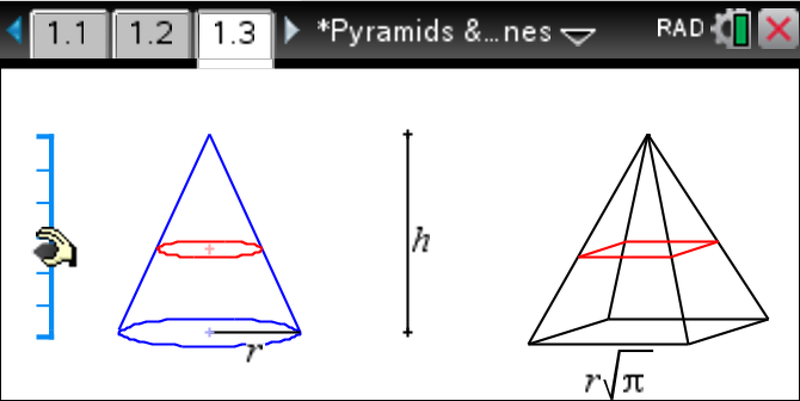 Dynamic geometry software shows us that the cross sections have the same area. Convince yourself that they do. And then I looked at the next page, which allowed me to move the cross sections and see the similar triangles change. So what does this tell us about the volume of a hemisphere? According to Cavalieri’s Principle, it has the same volume as the solid on the right. 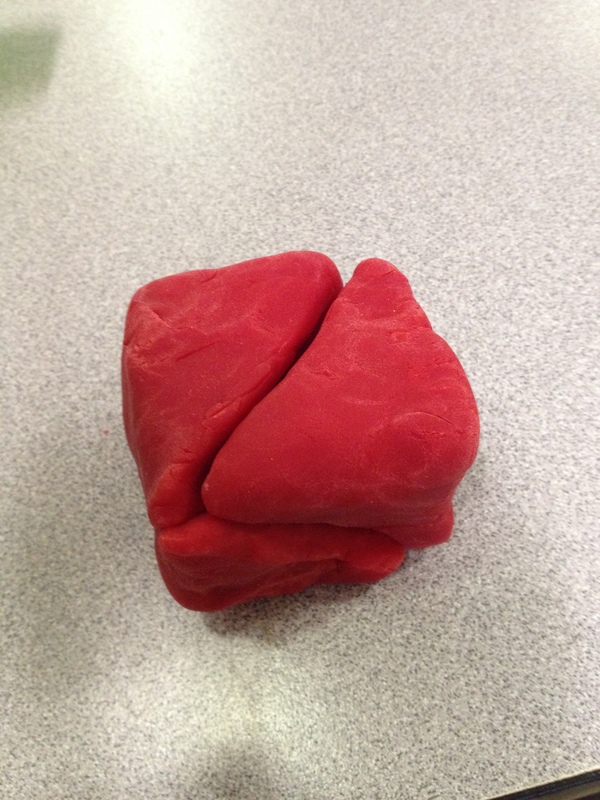 How can you calculate the volume of the solid on the right? 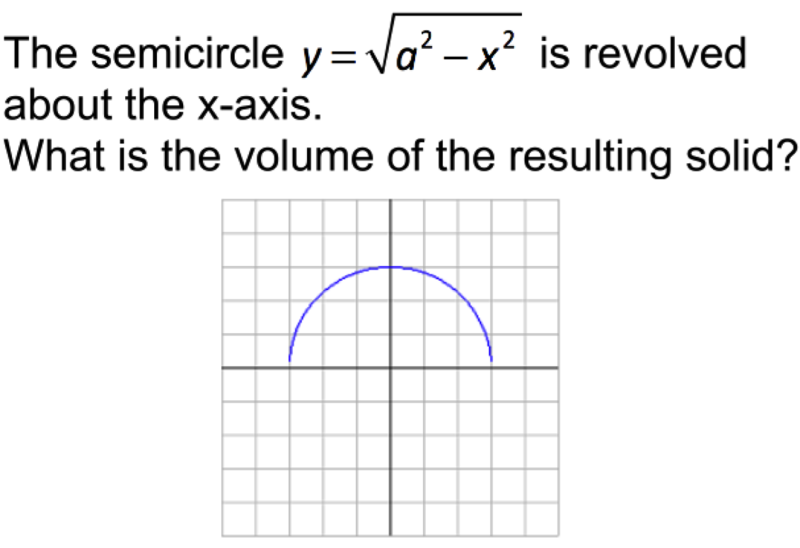 Subtract the volume of the cone from the volume of the cylinder. And then what about the height of a sphere for which this hemisphere is half? 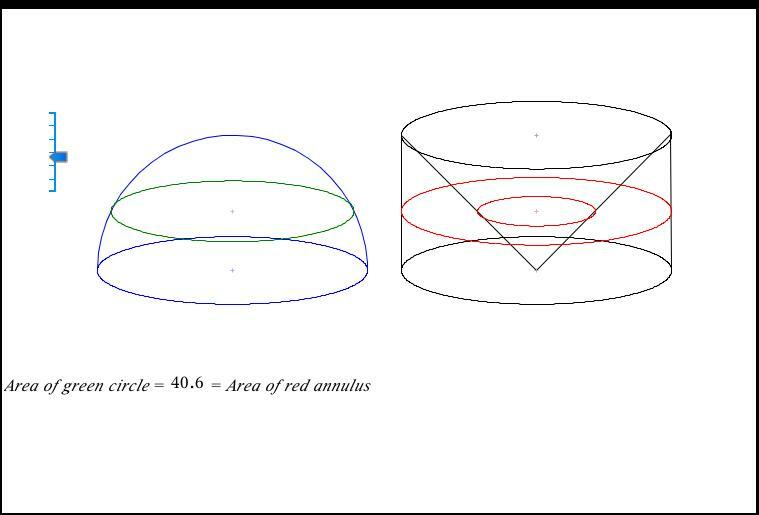 The Illustrative Mathematics task Use Cavalieri’s Principle to Compare Aquarium Volumes could be helpful for exploring Cavalieri’s Principle. I’ve had it tagged for several years now. Maybe this will be the year we take time to try it. 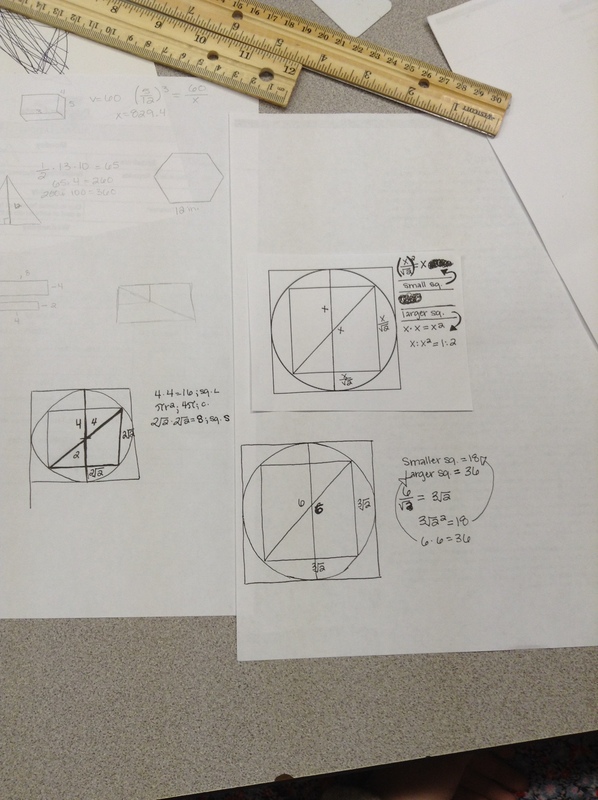 We started our performance assessment task day for Geometric Measure & Dimension with Circles and Squares, a Mathematics Assessment Project task. 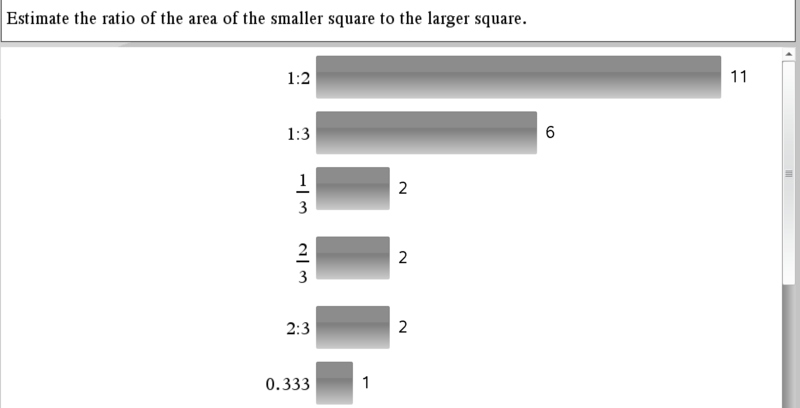 Several students wondered about the ratios of the areas of the figures. 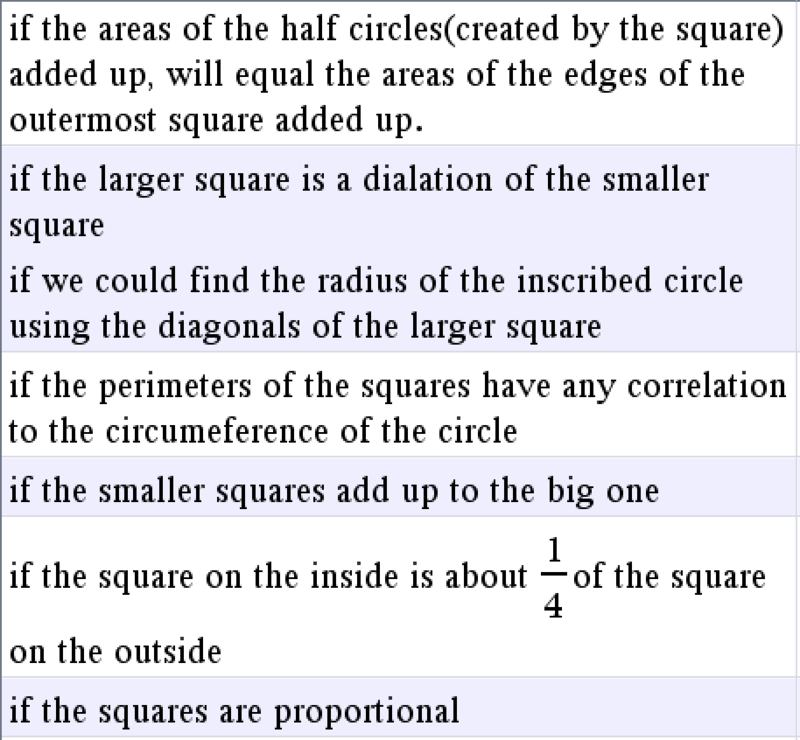 Without doing any calculations, what is the ratio of the area of the smaller square to the larger square? Now practice look for and make use of structure. We did the usual and purposeful individual work then team work before sharing with the whole class. I loved watching students look for and make use of structure to make sense of the relationships in the diagram. 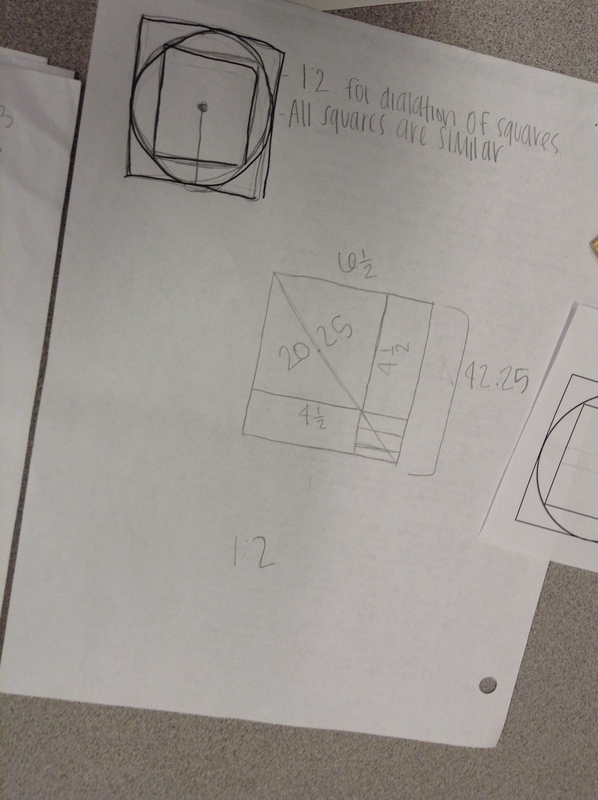 And then successfully determining the ratio … even though there is always room for more attention to precision.